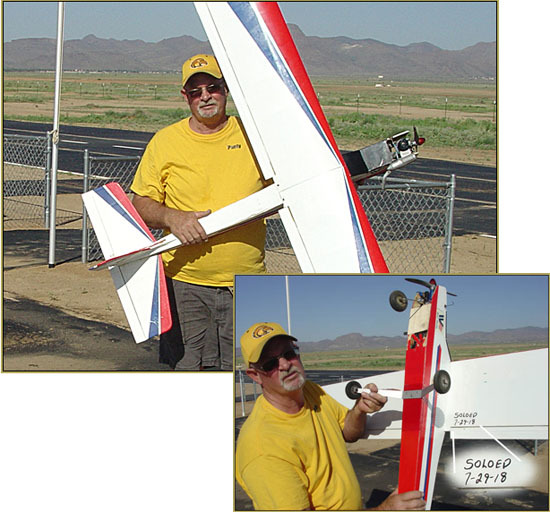 Our Pauly Solos… flies his Nitro trainer: earns his wings! Paul “Pauly” Forsyth proudly holds his trainer after his solo flight… Well done, man! 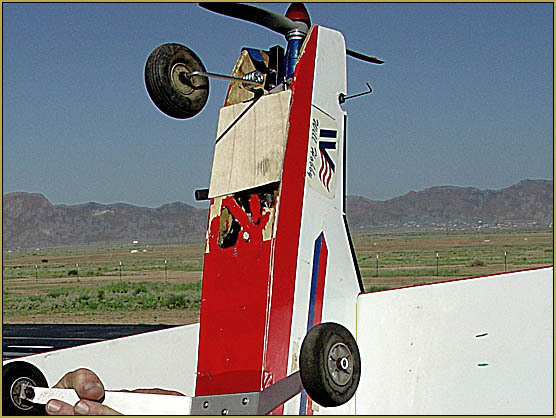 Pauly got started with learning to fly RC last November. Then came the turmoil with the field and a shuffling of instructors… and then he and Boyd Hunt, Golden Eagles RC Club co-founder and one of our flight instruction IP’s, got together… and Boyd was able to train this eager student… teaching him how to fly a nitro trainer… not one of those modern little styrofoam gyro-engaged electronic gadgets, no!… a good old-fashioned heavy-weight nitro-burnin’ white-smokin’ oil-throwin’ high-wing “flying truck” of a trainer. Along the way, Pauly teamed-up with Worth, Shawn, and Dan to fly electric sailplanes… with nice success! Pauly learned how to apply MonoKote covering and he made all of his own repairs, as needed, to his trainer… and, man?, were they needed! … but Pauly is totally excited about the hobby, enthused about the club, and is totally thrilled to have made his solo flight with that nitro trainer. Look at that trainer… well used and abused… and repeatedly repaired… and good to go for another year of flyin’! Way to go Paul flying is a great hobby see you at the field soon.